The introduction of Ethereum in 2013, an innovation by the unassuming maverick coder Vitalik Buterin and his bunch of friends, made some serious waves within the digital community. Unlike the Bitcoin blockchain, the Ethereum blockchain was a flexible and powerful platform that enabled decentralized, uncensored app development. But the frenzy was short lived as a major event created a vertical split in the community and also split the Ethereum blockchain. The split is looked at as psychological, technical and ideological. The debate of “Ethereum vs Ethereum Classic” has been raging ever since. The conflicting record of events and conspiracy theories that abound have never failed to incite members of both communities into heated public arguments. How and why did the Ethereum blockchain split? To get to the answers, let’s quickly travel slightly back in time to 2016 to the collapse of the ambitious DAO, or Decentralized Autonomous Organization. The DAO was proposed as the single largest and momentous innovation that would revolutionize not only Ethereum but the world as we know it, forever. It was aimed to be a gigantic venture capital fund that would fund all future app projects on the platform. It was aimed to be a truly democratic system that would work on community consensus and would never require third party intermediation. All interested community members would need to buy DAO tokens by paying a certain amount of ether to be able to get voting rights and decide which apps (Dapps, or decentralized apps, as they are known) the community should fund. For a Dapp to be in contention for acquiring funding from the Ethereum community, it needed to get the approval of some reputed names in the community. Once the Dapp idea was “whitelisted” voting would occur. If the idea received 20% approval, it would receive the required funds. With an idea this revolutionary, it was no wonder that it captured the imagination of the community and within slightly less than a month from its inception, the DAO raised a whopping $150 million through an ether crowdsale. This was worth 14% of all ether tokens at that time. For community members who wanted to exit the DAO, maybe because they did not support a Dapp development, an exit door, called the “split function” was created. This enabled them to get a refund of their ether and, if they desired, could also split off with multiple members and create, what was known as, a “Child DAO” and start accepting proposals themselves. A condition was, however, put within the smart contract that necessitated exiting members to hold on to their tokens for 28 days before spending them. Unfortunately, this last precondition led to the downfall of the DAO because someone found a technical loophole within it that was exploited. June 17th, 2016 was a black day in the history of Ethereum when an attack that exploited the very loophole that community members had earlier pointed out left the DAO $50 million poorer. While not going into details of the technicalities of the attack, suffice to know that $50 million worth of DAO tokens were removed and stored in a Child DAO. Hell broke loose when news of the attack spread like the proverbial wild fire. This created serious ramifications among which was the shattered belief of Ethereum loyalists on the philosophy of a DAO and Ethereum in general. Mayhem broke loose and the price of Ethereum, still in its nascent stages, plunged. There was wide scale hysteria and despondence as members of the community discussed the course for the future. All was still not lost as the tokens were still held in the Child DAO and couldn’t be removed completely before 28 days, as written in the smart contract for the split function. The community decided to take action. Again, without getting into details, suffice to know that a hard fork was decided. This is where things started getting murkier. While many members believed that a hard fork went against the basic philosophy on which Ethereum was based, the very real question of retrieving lost funds tilted the scales in its favor. A “hard fork” is a split (literally, a fork) in the blockchain. Once utilized, there was absolutely no going back. The original chain still exists and continues to function but if someone is on it, he or she never gets any benefits whatsoever of any updates of the upgraded version and cannot communicate with anyone who is on the new version. The hard fork also assured the return of the lost funds. But as mentioned earlier, it literally split, not only the Ethereum blockchain, but the community as well. 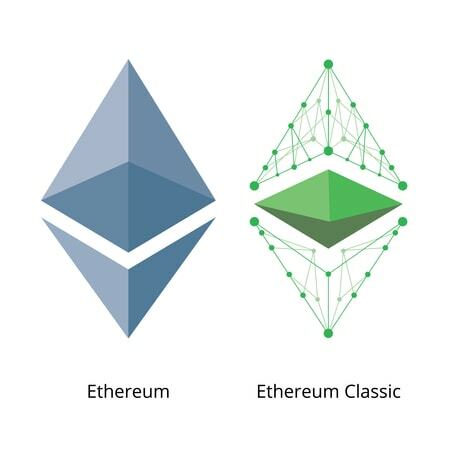 The heavyweights of the Ethereum community, including Vitalik Buterin and the other co-founders backed the new, upgraded version, which was named Ethereum while many “anti-fork” members stayed loyal to the original chain and named it Ethereum Classic. They also alleged that consensus in favor of a hard fork was never reached and members were tricked into voting for it. The jury is still out on the controversy and what happened in the aftermath of the DAO attack is a thing of endless debates on Ethereum vs Ethereum Classic. The loyalists of the original Ethereum believed that a hard fork manipulated the original code. When Ethereum was introduced, it was marketed using a tagline “Code is Law.” So these people believed that the law was broken. However, most other members believed the fork was necessary to protect the integrity of the blockchain, retrieve lost funds and also protect the community. Today, there is no comparison between the two blockchains in terms of market cap and popularity and the Ethereum vs Ethereum Classic debate is mostly ideological than anything. Ethereum (ETH) now commands a market cap of around $15 billion and is the second most valued cryptocurrency in the market, whereas Ethereum Classic (ETC) has a market cap of only $1.5 billion. Today, Ethereum is more like a software company, albeit decentralized and has the support of many vocal members and brand ambassadors. The Enterprise Ethereum Alliance is a network of Fortune 500 companies like Microsoft, JP Morgan, Accenture that collaborate to build enterprise-grade software to handle complex applications for businesses of today. Today, there exists an ideological difference between the two communities. Many people who believe that Ethereum is becoming a corporation that is going away from its core principles are also jumping ship to join Ethereum Classic. While many consider Ethereum as nothing more than a mutation of the original thought behind a decentralized immutable platform, backers of the new Ethereum believe that it is the result of a defining and momentous victory over a major attack on a platform. It is hailed as the victory of a community that came together and fought off a vicious attack as one to protect shared interests. Finally, the power of any decentralized platform lies within its community. Today, the vast majority of people are with Ethereum and continue to power its spectacular rise every single day. It is the platform of choice for most new Dapps being introduced in the market. ETC, on the other hand remains a figment of the ideological struggle that pitted Ethereum vs Ethereum Classic. So, where do you want to be?